Custom roof racks and parts for your Toyota Land Cruiser. We set out to create the first ever universal fit Land Cruiser roof rack, specifically designed for the Toyota Land Cruiser wagon platform. The goal was to incorporate a series of slotted mounting plates, and one of three tower configurations to make a rack system that would bolt to any FJ60/62, FJ/FZJ80, and UZJ100 series wagons. 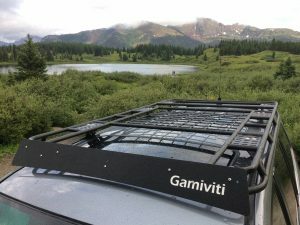 That business model remains true today, as those three vehicle styles remain the most popular for Gamiviti roof racks, and being able to cover 1983 through 2007 model year Land Cruisers was not a bad place to start, and an even better one to continue to play in. So with that scope in mind, we designed the foundation from which an entire line of roof racks has been built, with that initial inspiration of a universal fit, low profile, and great functionality. We make products we use ourselves, and we don’t sell anything we don’t like.